If You Wanna King on Indian Road Then Your Wait is Over Because Jeep Compass is Launched Already in India.So If You are Looking For Real Thril Then Go to Your Nearest Jeep Showroom and get a Test Drive of Jeep Compass Today. 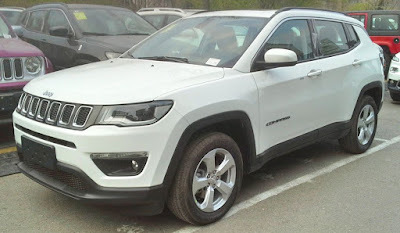 Jeep Compass Comes In Two Engine Option 1.4 Litre Turbocharged Petrol Engine & 2 Litre Diesel Engine.The Petrol Engine Genarates 160PS and 250Nm, and will be Available with a 6-Speed Manual and 7 Speed Dual clutch Automatic Gearbox.on the other hand Diesel Engine Genrates 173PS and 350Nm and is Available with a 6-speed Manual Transmission.As Per The Jeep Information 9 Speed Automatic Version will be Available with the Diesel Drivetrain Engine Option by The End of This Year, or Early Next Year. Jeep Prices Start at Rs 14.95 lakh for the Petrol Engine and Rs 20.65 lakh For Top End Diesel in India (Ex-Showroom Delhi).The Jeep Compass SUV Comes With 18-inch Alloy Wheels (in Top End Limited Model) and gets features Like bi-xenon Projector Headlamps,Daytime Running LED Lamps and a Two Tone Paint Scheme. The Interiors Comes with Black and White Colour Scheme , and 7.0 inch Touchscreen Infotainment System Makes Your Entertainment Superb with Apple CarPlay and Android Auto, 6 Speaker Sound System and Dual Zone Climate Control To Stay Cool In Indian Summers. Jeep Compass Top End Model gets 6 Airbags, ABS Brakes,hill hold and Electronic Stability Control.Main and important Thing About Jeep Compass is 4WD Option Comes with Only Top End Diesel Model For India.